When it comes to planning and organizing, one area that I have always been pretty short-sighted with is meal planning. After a little bit of practice, I have been able to grocery shop and mostly stick with the items on my grocery list, but that list is only for one week at a time. Many pro-organizing mamas swear that the real cost savings occur when you can get your grocery shopping down to once a month. Since we eat a lot of fresh fruits and vegetables in our house as well as deli meat, once a month probably won’t ever be completely realistic. However, it would be fabulous if we could get the grocery shopping down to every other week or twice a month. The key to a delicious cost-effective meal schedule and efficient grocery shopping is having a good plan in place. For this week’s addition to the home management binder we have added a blank monthly dinner plan template. Broken down into four-week sections, this plan will give you a quick glance at the upcoming meal schedule as well as an easy resource to compile your grocery shopping list. To fill this form out, simply add in a tentative (or strict, depending on how rigid you would like to be with it) dinner schedule for the next week (or 2 or 3 or 4). Having trouble coming up with something for dinner? The question of “What are we going to have for dinner?” has plagued us all at some point or another. If planning dinner for tonight seems exhausting, planning for a week or a month will seem impossible. Here are a few tips to help you start planning dinner beyond this afternoon. Let’s face it, not every meal that comes out of our home kitchen is a success. I find it quite disheartening, but with a new day comes another opportunity to crank out a Food Network worthy masterpiece. When you have a meal that the family really likes, jot it down (or if you are using the meal planning template, add a star by that meal). Most families only have a dozen or so dinner recipes that get repeated throughout the month. Keeping the dinner menu fresh not only keeps complainers at bay (ugh meatloaf again), but also helps to expand the palate and increase the chances of receiving nutrients that might be lacking. If you can, try not to cook the same meal more than once a month. When you are making the next month’s dinner plan, look back at the previous month’s meal plan. Hopefully, you now have a handful of family favorites to plugin for the next month! Did you know that there are hundreds (probably thousands) of great meatless meal recipes online? We have included several on our website. Type “Meatless Monday” in the Search box to give a few of our favorites a try. Meatless Monday is an easy way to shift the focus of the meal and encourage a healthier lifestyle. Generally, meals without meat are not lower in calories and fat, but are less expensive as well. When planning, it also focuses one day a week to a specific type of meal which helps to eliminate other recipes from the start. Another way to bring diversity to the dinner plate is to focus on different styles of cooking when preparing the meals. If we go meatless on Monday, what about the other days of the week? Does your family love to eat out at the Mexican restaurant or order Chinese takeout? Work these styles into your own cooking and menu creations. Every Tuesday consider a hispanic-style recipe. On Wednesday’s, consider try a recipe with asian-inspired flare. Either way, it helps to narrow down the choices and make the planning just a tad bit easier. – Steak, Fish, or Chicken? A wedding invite isn’t the only time this question is viable. When making your menu for the month, think about how many times each week specific types of meat are used as the main entrée. Too many chicken nights for week 3? Spread it out to the next week. If your family is willing to eat leftovers (hey, I love leftover meals! ), make extra portions for certain meals, freeze the leftovers, and work it into later in the month. Foods like lasagna, chili, soups, etc. all tend to freeze really well. Add a fresh salad as a side and that’s one less cooking day for you! Does your family partake in family game night? Make Friday a pizza night. Once you start to get a few of the blocks filled in, the easier it gets to fill in the rest. After a few months of favorites, you (and me!) will be a pro like the rest of them. 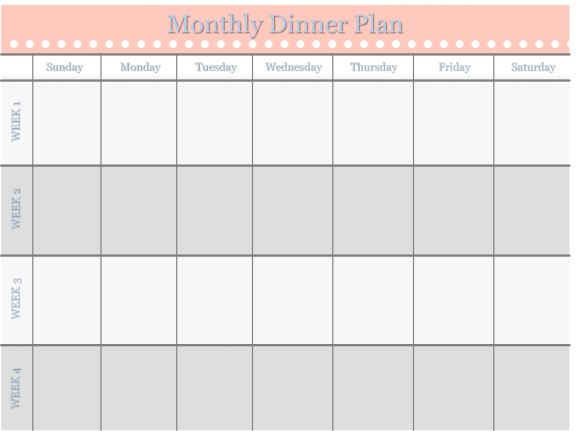 Until then, here is a blank monthly dinner plan template to help you get started.